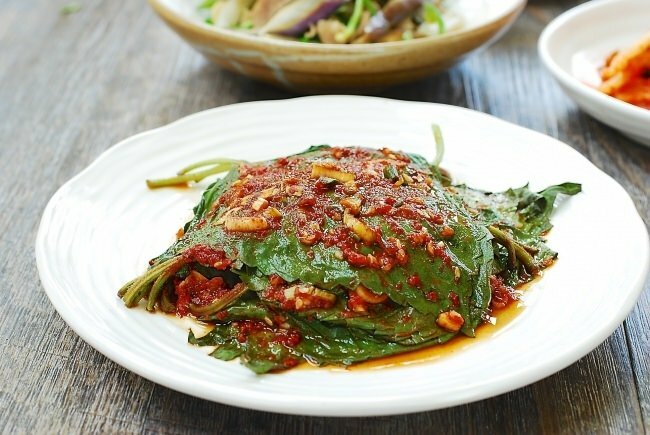 This steamed perilla leaf side dish (kkaennip jjim, 깻잎찜) is a summer favorite! While pickled kkaennip is a staple side dish all year around, this dish is enjoyed in the summer when fresh perilla leaves are plentiful. 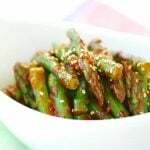 It’s one of those dishes that brings back memories of my childhood summertime meals that were made with lots of fresh vegetables. 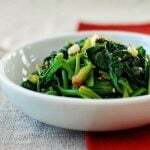 The fragrant perilla leaves are lightly seasoned with a simple mixture of seasonings. 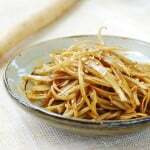 Briefly steaming mellows the taste of this strong flavored vegetable while keeping the freshness of the leaves. 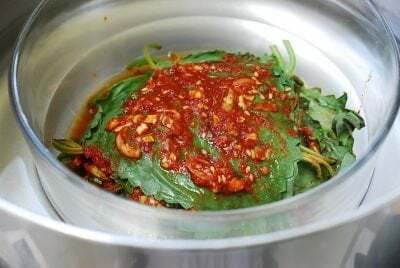 If you find fresh perilla leaves a bit too strong, try this steamed version. Once you clean the leaves, it only takes a few minutes to put the sauce together and steam the leaves either over the stovetop or in the microwave. 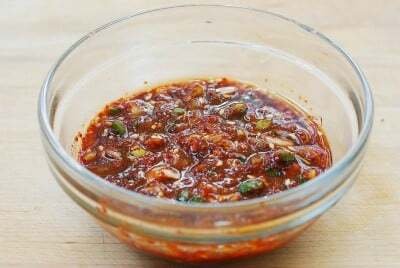 I made it quite spicy here, but you can always reduce the amount of gochugaru or omit it entirely to make the dish mild. 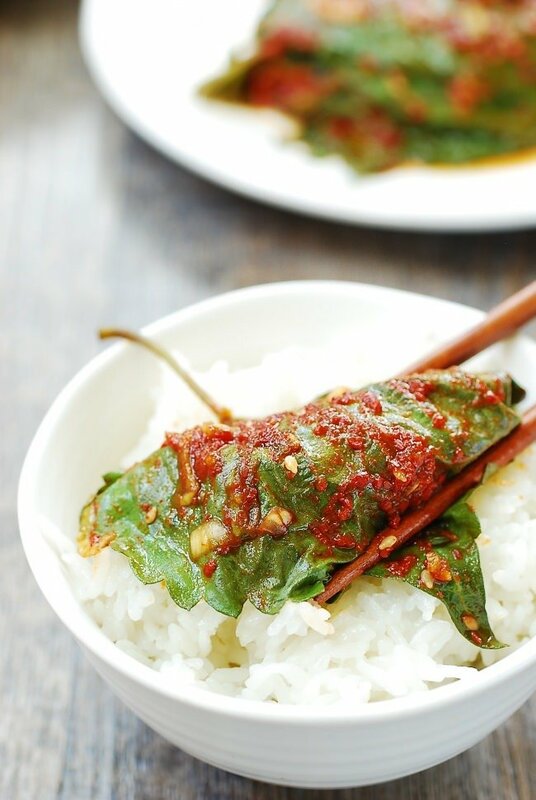 Pick up a leaf with chopsticks and wrap a bit of warm rice in it and enjoy. It will surely perk up your appetite! 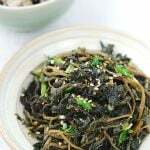 For other uses of summer’s abundant perilla leaves, see kkaennip kimchi, ssam (wraps) for meat or fish, bibim guksu, kkaennip jeon, gamjatang, gimbap (rice rolls), and pork rolls. 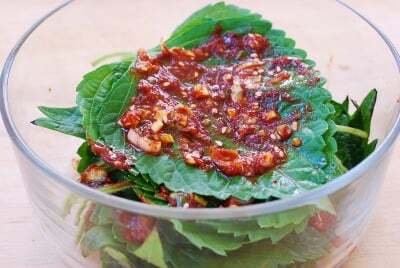 Steamed perilla leaves with a simple seasoning - quick and easy Korean banchan! 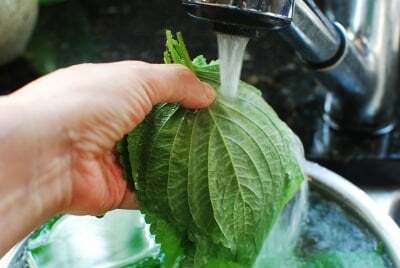 Wash the leaves thoroughly (especially the back sides) under running water, one leaf at a time. Hold the stems together, and shake off the excess water. Place them in a colander to further drain. Mix all the seasoning ingredients well in a small bowl. 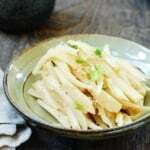 In a heat proof or microwave safe bowl, place 3 or 4 leaves at a time, and spread a teaspoon of the sauce all over the top leaf. Repeat the process with the remaining leaves. Rotate the location of the stem part of each batch to level the stack. Pour any remaining sauce around the leaves when all the leaves are used up. To steam, boil about 1-inch high water in a large enough pot to loosely fit the bowl with the perilla, and then carefully place the bowl in the pot. Cover, and steam for 2 to 3 minutes. Adding a folded paper towel at the bottom will prevent the bowl from rattling in the boiling water. Another option is to wrap the bowl tightly with plastic wrap and microwave for 2 minutes. 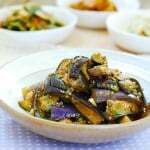 Thank you, Ms Roh, for teaching me how to cook yummy authentic Korean dishes for my family! You’re welcome! I’m glad to be helpful. Thanks for stopping by and leaving me the note. Happy cooking! 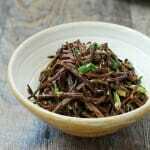 Loved this perilla recipe even more than the first one. Thank you so much for sharing! 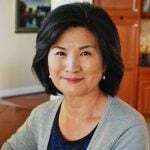 Hey, I love your recipes, I’m learning so much about Korean food! 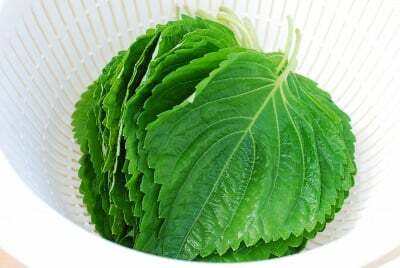 I’m having trouble finding perilla leaves in my local asian markets, I have an independent one and a H-mart nearby, but I can never find perilla leaves. They both carry perilla oil, and I think they have seeds but I dont know about the leaves. Are perilla leaves not available in the winter? When I asked for perilla leaves I got confused looks, is there something else I should ask for at the stores? Thanks! They are not in season, but still available around here in northern Virginia. I recently bought them. 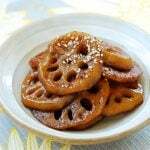 Did you ask for kkaennip (꺳잎)?